Spring’s hottest ticket is about to fringe and flaunt its way into a second weekend. We’re talking Coachella Valley Music and Arts Festival, the trendsetting, celebrity hotspot that boasts some pretty epic experiential marketing programs on top of epic performances. Ahead of the Indio, CA festival’s second and final weekend, April 19-21, we offer our roundup of the brands that have come out to play in the desert. At the heart of the program was Khalid, a Coachella headliner and the biggest musician BMW has worked with to-date. Riding on the success of the April 5 release of his album “Free Spirit,” the contemporary soul artist (and BMW driver) helped the brand outfit an assortment of its vehicles to match the aesthetic of the album cover, which features flames and a wolf. The theme of the campaign: youthful joy and freedom. Ahead of Coachella’s opening weekend, BMW’s influencer partners, including personalities like Paris Hilton, Laura Marano and Ross Butler, each headed to Palm Springs in a newly decked-out BMW and, of course, documented their journey on social media. Riding on that initial buzz, Khalid then announced his Road to Coachella Pit Stop to fans online. 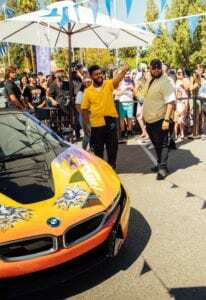 The Pit Stop, which was located at the BMW of Palm Springs dealership and was open to guests Thursday through Sunday of Coachella’s opening weekend, was home to an array of exclusive merchandise, the “Free Spirit” fleet of BMWs and Khalid’s own van, also designed to match the artist’s album cover. In addition, there was a claw machine that gave fans a chance to snag custom Khalid Road to Coachella bandanas (which could be custom embroidered on-site), food trucks, games, music and, on Saturday—a visit from Khalid himself. Agency: Mirrored Media, Santa Monica, CA. Coachella CHRISTOPHER POLK FOR TEEN VOGUE. 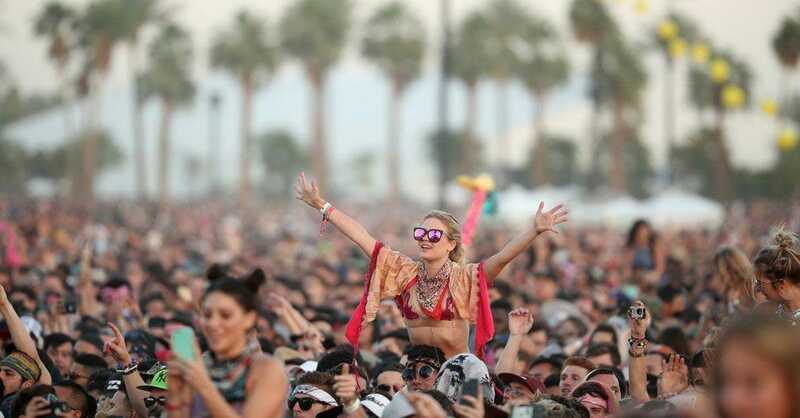 Coachella has become one of the biggest festivals in the country with over 125,000 attendees each weekend this past year which does not include the number of people that travel to the area for the parties or activations. It is estimated that Golden Voices’ Coachella and Stagecoach generate approximately $900 million in economic activity around the Coachella Valley area. With the majority of attendees contributing to the almost billion dollars in economic activity consisting of Gen Z and millennials, major brands have the opportunity to build relationships with new audiences that they would not typically interact with otherwise. “For brands, identifying influencers is easy. Paying them to post is easier. Building a trusting relationship where both sides can add value to the other (without feeling used) is the ultimate challenge. ‘Return On Influence’ is the new ROI,” says Christopher Rockwell of LOVE, a brand strategist who helps companies like Audi, Fendi, and Google. Revolve has proven that activating at Coachella is a must for brands looking to boost revenues while staying culturally relevant. But Revolve isn’t the only brand that shines its presence in the desert; Express, BMW, American Express, Create & Cultivate, Rachel Zoe, Levi’s and Neon Carnival have all invested in creating an experience to connect with existing customers while reaching a new audience. 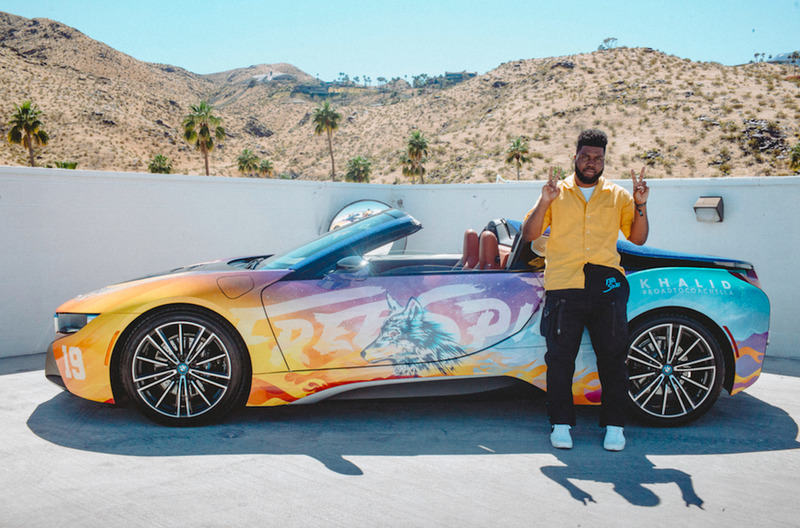 BMW returned to the desert for #roadtocoachella produced by Mirrored Media with Khalid as their 2019 artist. 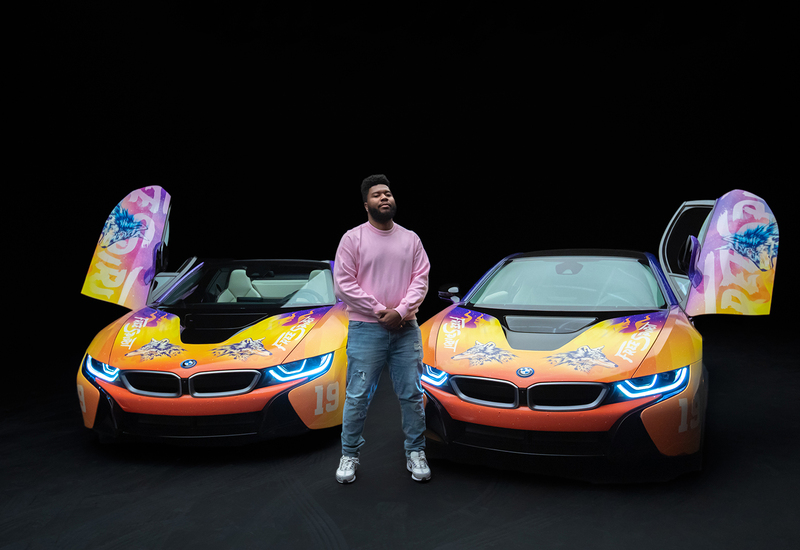 Khalid designed the art for a fleet of BMW i8’s to be driven down to the popup by influencers and celebrities. At the popup, fans got to meet Khalid, shop the collab merch and test out the i8’s. BMW has taken an unconventional approach in making its activation more about a lifestyle rather than a car. “As the world´s most vibrant music and art festival, Coachella is an ideal match from a brand perspective. At BMW, joy is in our DNA, and with experiences like #roadtocoachella, we are able to connect authentically, yet unconventionally with young (at heart) people in a very emotional way. Coachella broadens our community from an automotive company to a more accessible & inspiring lifestyle mobility brand.” Stefan Ponikva head of BMW events and BMW group shows. Are you “Young Dumb & Broke?” Are you looking for a “Better” way to get from the “Eastside” to Coachella? Well here’s your chance to ride in style! iHeartRadio has teamed up with Khalid and BMW i to send you to Coachella in a BMW i8! That’s right, we’re giving you airfare to the Coachella Valley, hotel accommodations throughout the festival weekend, 2 VIP tickets and VIP passes to park your Khalid wrapped BMW! All you need to do to is listen to Khalid radio on iHeartRadio and ENTER TO WIN! Riding on the heels of its successful Road to Coachella campaign in 2017, BMW i put its show on the road once again this year to drive awareness of its i Series electric and hybrid vehicles, reach new audiences and engage the creative, passionate (and eco-friendly) demographic Coachella tends to attract. The brand’s presence reached far and wide, encompassing an artist partnership, a robust influencer program and two special events. It was the second year BMW i served as an official sponsor of the festival. This year’s Road to Coachella program centered on BMW’s partnership with John Gourley, co-founder and lead singer of one of the festival’s most highly anticipated performing bands, Portugal. The Man, and an accomplished visual artist. Gourley was enlisted to create a one-of-a-kind design that was wrapped around each car in the BMW i Coachella fleet. The artist’s creative process, including the reveal of the wrapped vehicles, was documented on the brand’s social channels to give digital fans a taste of the action. In addition to Gourley, BMW partnered with 15 influencers from around the world, including Kellan Lutz and Dorothy Wang, to share their own Road to Coachella journey in one of the custom-wrapped BMW i8s. The tastemakers documented their entire road trip, stopping at iconic locations along the way and, of course, sharing the content with millions of followers. The brand also teamed up with lifestyle company The h.wood Group to deliver two large-scale events that collectively drew 6,000 attendees: Poppy’s BMW i Powered Paradise and Poppy’s BMW i Recharge Oasis, both of which took place at a sprawling estate just outside the festival grounds. As guests arrived at each event, they were met with a fleet of the wrapped i Series vehicles, and invited to hop in for the first shareable moment of the night. Other share-worthy engagements across the events included a neon art installation featuring a metal BMW i3 frame traced with neon flex lighting, a neon photo booth experience with the new BMW i8 Roadster that could be shared instantly, and a custom-wrapped claw machine game. Prizes in the machine included custom-designed bandanas created by Gourley, four of which also had a hidden key to a BMW i8. The four lucky winners who clawed their way to the coveted key earned an extended weekend test drive of the Roadster. In addition to myriad photo ops, the events also included performances by Diplo, Travis Scott and Lil Wayne, to name a few, and attracted a host of celebrities including Rihanna, Gigi Hadid, The Weekend and Paris Hilton. Other touchpoints included the unveiling of Kylie Jenner’s new makeup collection, ‘KOURT X KYLIE,’ as well as the launch of Kendall Jenner’s Pizza Boys Radio program on Apple Music’s Beats 1. “The second chapter of our Road to Coachella campaign really developed beyond our initial expectations,” says Rittenhouse. “Not only was John’s design unique and eye catching, throughout the week at Coachella we had the opportunity to work alongside some amazing celebrities and creators to capture and share their Coachella experience.” Agency: Mirrored Media, Santa Monica, CA. Mirrored Media is proud to announce that our BMW Road to Coachella campaign has been selected as a finalist for two Chief Marketer’s Pro Awards. The editors of Chief Marketer have announced this year’s PRO Awards finalists, the best brand activation and promotion marketing campaigns in the world. For 28 years the PRO Awards has been the world’s leading recognition program for excellence in promotion marketing. From buzz campaigns and content marketing, to influencer programs and experiential activations, and beyond… this year’s finalists represent the best and brightest ideas, executions and results-driven campaigns of the year. Judged entirely by a panel of brand-side marketers, this year’s PRO Awards will honor winners across 32 categories at the 2018 PRO Awards gala on June 19th at espace in New York City. Come join hundreds of the world’s leading marketers at the industry’s most commemorative affair. Congratulations to all of this year’s finalists. See the full list of finalists HERE. BizBash recently looked at 34 of the best activations at and around Coachella. BMW i’s Road to Coachella not only made the cover, but was covered as two of the best activations around Coachella this year. Read the whole article HERE. Music lovers, millennials, and influencers—as well as the brands trying to reach them—flocked to the first weekend of Goldenvoice’s Coachella Music and Arts Festival, held from April 13 through 16 at the Empire Polo Club. With more parties than any individual could possibly attend in a single weekend, brands used a variety of tactics to entice guests to attend their events. Securing high-profile performers remained a popular go-to for many hosts, while an emphasis on wellness-centered offerings emerged as an increasingly popular trend this year. Other brands sought to upgrade festivalgoers’ experience on the polo fields with exclusive lounges and customization opportunities. Here are 34 of the cleverest activations, entertainment, and decor ideas that popped up everywhere from swanky Palm Springs estates to branded tents on the festival grounds. 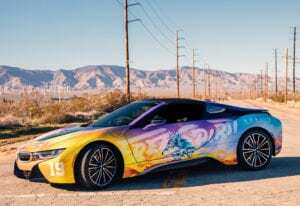 The automotive company partnered with experiential marketing firm Mirrored Media for a campaign that saw 15 BMW i8 and i3’s wrapped in a colorful custom design created by Portugal the Man’s John Gourley. Social-media influencers then drove the iFleets to the festival, sharing their road trip with followers along the way. Building on the success of 2017’s multiple-award-winning Road to Coachella campaign, BMW i returned to the desert in 2018 with a fresh take on the groundbreaking idea. This year, the Road to Coachella focused on a creative partnership with John Gourley of the multi-platinum group Portugal. The Man, one of the most anticipated performers of the iconic festival. Gourley is an accomplished visual artist in addition to his role as the band’s co-founder and lead singer. He drew inspiration from Coachella and BMW i to create a custom one-of-a-kind design that was wrapped on the BMW i fleet for the Road to Coachella. Gourley’s creative process, including the big reveal of the wrapped i8 and i3, was all documented and released on BMW’s socials as well as its official website. The entire campaign was announced with two teaser videos via Coachella’s official social media channels. In addition to John Gourley’s creative aspect, we also enlisted 15 social media influencers from around the world who each embarked on their own Road to Coachella. These creators documented their road trip as they made their way to the Coachella Valley, stopping at iconic destinations along the way. Each influencer’s journey was experienced through compelling social media posts to their millions of followers, all centered on the fleet of custom-wrapped BMW i8s and i3s. Influencers included Kellan Lutz, Nick Bateman, Dorothy Wang, Jack Baran, Jenn Im, and more. See them all at #RoadtoCoachella on Instagram. Outside of the festival, the brand partnered with nightlife leaders the h.wood Group to present two of the largest events: Poppy’s BMW i Powered Paradise on Friday night, and Poppy’s BMW i Recharge Oasis on Sunday afternoon. On Friday night, Kylie Cosmetics celebrated the launch of the new makeup collection ‘KOURT X KYLIE’ & the launch of Pizza Boys Radio on Apple Music’s Beats 1. More than 6000 guests were shuttled from a remote parking lot to the secret location of the parties, which took place at a sprawling estate just blocks away from Coachella. As guests disembarked from the shuttles, they were greeted by a fleet of Gourley-wrapped BMW i display vehicles that they could climb into for the perfect shareable photo as they entered the party. The events featured performances by Diplo, Travis Scott, Lil Wayne, Pizza Boys, Post Malone, and more. The star-studded parties drew attendees like Kylie Jenner, Kendall Jenner, Rihanna, Gigi Hadid, Bella Hadid, The Weeknd, Demi Lovato, G-Eazy, Halsey, Paris Hilton, Kourtney Kardashian, and many more. The parties included several custom BMW i activations. An interactive neon photo booth experience with the brand new BMW i8 Roadster gave guests a chance to create their own instantly shareable video. A custom-wrapped claw machine housed custom bandanas designed by John Gourley, with four of those bandanas hiding a BMW i8 key. The four lucky guests who clawed their way to a key won an extended weekend test drive of the all-new BMW i8 Roadster. Another popular photo moment inside the event was a BMW i3 neon art installation, which featured a metal i3 frame traced with neon flex lighting. BMW i teamed up with experiential marketing firm Mirrored Media for a second year of the Road to Coachella campaign. Mirrored Media is excited to announce that our BMW Road to Coachella campaign has been announced as a finalist in the automotive category of the AME Awards. The AME awards is the only award show to recognize excellence in advertising and marketing effectiveness on a global scale. AME Awards honors work that demonstrates ground-breaking solutions to challenging marketing problems across the globe. The competition is judged by top industry experts from all over the world. The first two rounds of judging is divided by region. This allows all entries to be reviewed in its social, economic, and cultural context to determine the Shortlist and Medalists. Winning campaigns address a challenge in the marketplace, with the creation of a thorough marketing plan to deliver a successful execution, and utilizing outstanding creative elements; they exhibit specific objectives accomplished through creative execution and strategic planning. Below is more information on the AME awards and our fellow finalists. “Since 1994, the AME Awards has honored campaigns from around that globe that are not only creative, but successfully demonstrate innovative solutions to challenging marketing problems. This year’s standout Shortlisted entries represent ground-breaking creative work that has achieved measurable results on behalf of the brand,” said Michael Demetriades, President and Executive Director of the AME Awards. 2018’s Shortlisted entries submitted from creative agencies around the globe boosted brand awareness and achieved exemplary results utilizing a robust number of strategies including guerilla marketing, branded entertainment, social marketing, sponsorships and promotions and cause marketing. To view the complete 2018 Shortlist please visit: https://www.ameawards.com/finalist-page. Innovative ideas placed brands out front and helped achieve measurable market share including such cutting-edge tactics as a talking store, snow tweets in the Alps, and tattoo ink created from motorcycle burn-out carbon. Brave New World Communications Pvt. Ltd. India’s Shortlisted campaign’s “THE HEART OF THE HIGHWAY – The World’s First Talking Store” for client The Roadster Life Co. featured a talking store, with a unique first-person voice, that reached out to shoppers creating the effect of personal interaction delivered by interactive in-store tech including custom software, digital façade, interactive and multiTaction touch screens, augmented reality green-screen, immersive VR and virtual shopping screens. Results included a 70% revenue spike in high-value apparel categories. Heimat Werbeagentur GmHB “Snowdrawings” for Swisscom, sponsor of the Swiss Ski team, wanted to be more than a logo and create a benefit for ski fans and showcase their extensive network. The telecommunications provider utilized a remote cheering app that allowed fans to send supporting tweets to the ski team and have them written next to the race track in the snowy slopes of the Alps. The tweets were visible for 2 miles and were created using automated snow blower-bots. Results—26 million impressions, 4 million video views and over 20 km of written messages in the snow. Team One Los Angeles, “Inking Our Mark on Motorcycle Culture” regained market share for Indian Motorcycles by leveraging a brand-first lifestyle media partnership and the world’s-first tattoo production technique formulated from the burn-out carbon from Motocross legend Carey Hart’s Indian Motorcycle. The process of making the ink and tattooing Carey were presented in a video along with a six-page custom print advertorial for Inked and offering a limited-edition run of Indian Motorcycle Ink™ in select biker-focused tattoo parlors nationwide resulted in the ink being sold out in a week. With zero paid traffic to Indian’s website, the results include 82% new visitors who spent an average 59% more time and visited 7% more pages than other visitors in the same period reinforcing success in generating qualified conquest leads. Indian went from 7th to 2nd most purchased motorcycle brand in the U.S. Branded Entertainment repositioned brands and increased brand affinity, Shortlisted entries include Zulu Alpha Kilo Canada’s campaign “Common Ground” for their docu-series that followed riders from around the globe on a trip across Canada for Harley-Davidson Canada. Discovery Channel picked up the series as a primetime special, increasing Harley’s market share. PHD China’s “Panamera O2O Brand Repositioning” for client Porsche re-launched the Panamera through an integrated sponsorship with the immensely popular series “Ode to Joy” making it better-aligned government and cultural climate and consumer needs and wants. Starcom Saudi Arabia’s “ALJ Toyota After Sales” for client ALJ Toyota created an animated web series for YouTube portraying the day-to-day life of a Saudi citizen. The film showcased ALJ after sale and maintenance services resulting in 94% change in brand perception with 49% increase in service appointments. HBO Multicultural Marketing “The HeLa Project” was launched as a lead up to the premiere of HBO’s film, “The Immortal Life of Henrietta Lacks.” The multi-day, multi-city, multi-media, travelling art installation consisted of a unique, impactful collective of artisans and thought-leaders from the African-American community. Touring activation resulted in 182 million media impressions. Oprah, the film’s star, promoted the film through promotional channels, including her social media accounts, a promotional press tour that included the cover of an Essence cover and hosting a junket for black female journalists (#blackgirlmagic), and show appearances. Over 6,500 guests attended, 77% of guests were more likely to watch “The Immortal Life of Henrietta Lacks”. Campaigns created to raise awareness for causes, or social and civic issues advanced. Shortlisted campaigns include: Dentsu Jayme Syfu Philippines guerilla campaign “Dead Whale” for client Greenpeace. The agency mounted a 73-foot decomposing “Dead Whale” installation on the shores of one of the most polluted cities in the Philippines during the 2017 ASEAN Summit. When examined closer, the whale was made entirely of plastic wastes collected from the ocean. The results—over 100 million impressions internationally and it caught the attention of ASEAN leaders, which put Coastal and Marine Protection in the proposal for the next Summit. Heimat Werbeagentur GmHB Germany’s Shortlisted campaign “A New Way of Thinking” for Free Democrats created a game-changing election campaign to reach and activate young voters and bridging the gap between the Liberal party and the voters. The digital campaign resulted in a comeback for the Liberal party. Entries utilizing Sponsorships raised awareness for brands and connected them with target audiences. Shortlisted entries include: QIYI China’s “Rising! Chinese Hip-hop” for client McDonald’s China connected McDonald’s with millennials via food and music creating The Rap of China, the first internet-based hip-hop contest. Havas San Francisco “Citrix & Red Bull Racing: This Is How the Future Works” for client Citrix. The campaign repositioned Citrix as a thought leader in the future of work, leveraging their high-profile partnership with the Red Bull Racing Formula 1 team and showcasing what Citrix can bring to any IT customer relationship. GMR Marketing “Lincoln Financial Group Presents: The Game Plan” for client Lincoln Financial leveraged their Philadelphia Eagles partnership to showcase best practices for financial planning by following a day in the life of players and illustrating that Lincoln Financial is a partner who will help them take charge of their financial future. Social platforms created buzz for brands resulting in measurable gains in market share along with Shortlist status. Grabarz & Partner Werbeagentur GmbH Germany’s “Laughing Horses” Volkswagen showcased the product benefits of the Trailer Assist, illustrating the stress of parking while someone is watching. This funny social video featuring laughing horses mocking a frustrated driver trying to park his trailer became the best performing German Volkswagen video with 40 million views. Other Shortlisted entries include: Team One USA “Platforms of Expression for a Shareworthy Life” for Lexus IS; TBWA\ Singapore “Justice Bao and The Missing Travel Insurance” for Singapore Tourism Board; Saudi Ministry of Health “Diabetes Monster” for Diabetes McCann New York “The Sound of Priceless” Mastercard; Al Jazeera Qatar “#DemandPressFreedom by Al Jazeera” for www.aljazeera.com; Brave New World Communications Pvt. Ltd. India “Once Upon a Highway” The Roadster Life Co.; and Mediacorp PTE Ltd. “Letter to My Son” for Mediacorp. Campaigns for automotive brands drove consumer engagement and gained traction for the brand. Agencies Shortlisted include Grabarz & Partner Werbeagentur GmbH “Laughing Horse” for Volkswagen; Socialize United Arab Emirates “Meet Kamal: The World’s Best Auto Salesman” for Mercedes-Benz; Mirrored Media “Road to Coachella” for BMW. The medal round is underway and AME’s Grand Jury awards Gold, Silver, and Bronze to the highest scoring entries through two rounds of regional judging to ensure scoring accounts for cultural and economic relevance. Gold-winning work from all regions is judged by the full international Grand Jury to determine a Platinum Award for each of the five regions (North America, Latin America, Europe, Middle East & Africa and Asia Pacific) and the International Grand AME Award. To view the complete 2018 AME Awards Shortlist, please visit: HERE. About the AME Awards® for Advertising & Marketing Effectiveness™: Founded in 1994, the AME Awards honors international work that demonstrates ground-breaking solutions to challenging marketing problems. To earn a coveted AME® Award, an entry must exhibit specific marketing goals and objectives accomplished through creative execution and strategic planning. Entries are judged by an international panel of top interactive and multidisciplinary marketers, media planners, strategy directors, social media experts, and creative directors. Mirrored Media is proud to announce that it has won a 2017 Summit International Emerging Media Award with BMW. This is the second year in a row that Mirrored Media has taken home an Emerging Media award. This first-of-its-kind partnership paired renowned composer and producer Hans Zimmer with BMW i to create an artistic and visually-inspiring content piece featuring an original score by Zimmer himself along with a cast of Coachella and influencer cameos. The concept was unique in that it gave BMW the opportunity to create an open dialogue with its target audience while also fostering a narrative around why BMW partnered with Coachella. The campaign told the story of the partnership while blending multiple forms of art including music, film, photography, and automobiles across multiple genres. The success of the campaign allowed BMW to focus on a new lifestyle line of marketing that has now changed the direction of its 2018 efforts going forward. the world.This award is for the marketers, coders, designers, developers, innovators, visionaries and leaders in this exciting new realm of advertising.